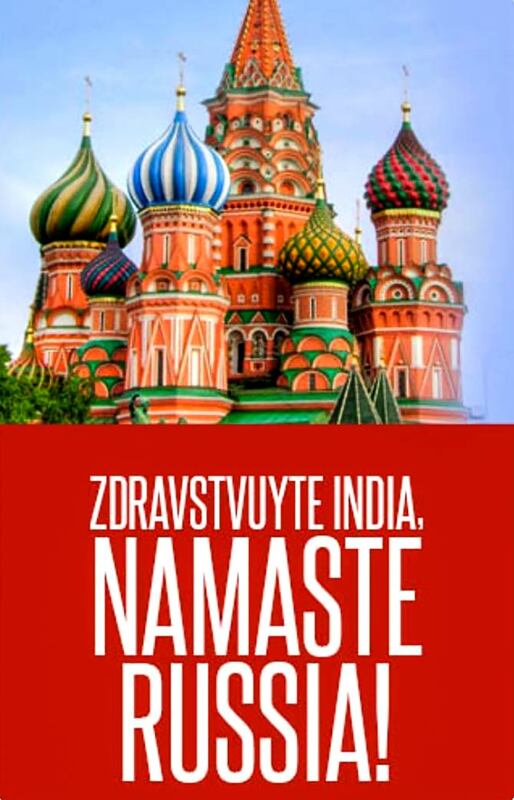 Russian firms expand their footprint in India. And take bigger steps to do business with India’s private sector. If you are not clued in, it’s unlikely you have heard of the VTB Group. It owns the second-largest bank in Russia, is known for its closeness to Russian President Vladimir Putin and the government there. Above all, is a financial powerhouse with a sprawling investment banking business. 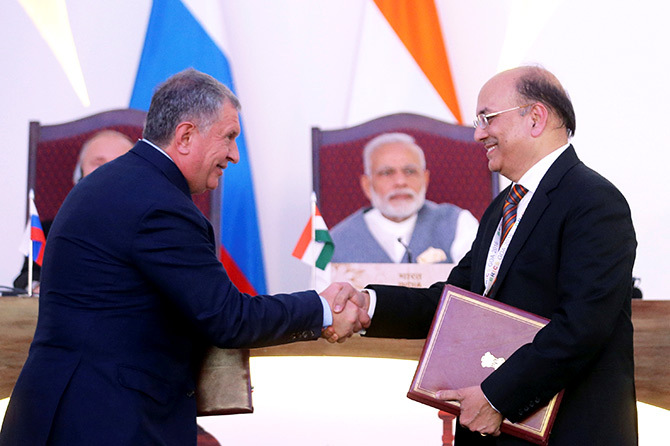 IMAGE: Igor Sechin, left, CEO, of Russia's top oil producer Rosneft, and Narendra Verma, managing director, ONGC Videsh Limited, exchange agreements after the India-Russia Annual Summit in Benaulim, Goa last year. Photograph: Sputnik/Kremlin/Mikhail Metzel via Reuters. Just recently, group company VTB Capital tied the knot with the Ruias and is planning to bid jointly for debt-ridden Essar Steel, which is being put on the market by the National Company Law Tribunal. This is not its first tryst with the Indian private sector. It has done business with the Ruias and the GMR Group by providing them funds to finance their delisting as well as their debt. And the group is among the top five on the Bloomberg list of top merger and acquisition deal-makers in India last year, because it partly financed Rosneft’s deal to buy out Essar Oil. VTB is not alone. 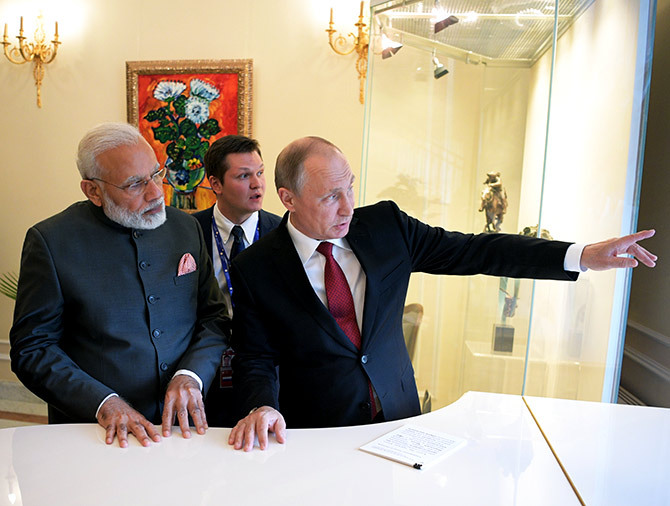 A bevy of Russian companies are now taking firmer steps to do business with India’s private sector companies after decades of working with only the government or State-owned behemoths. 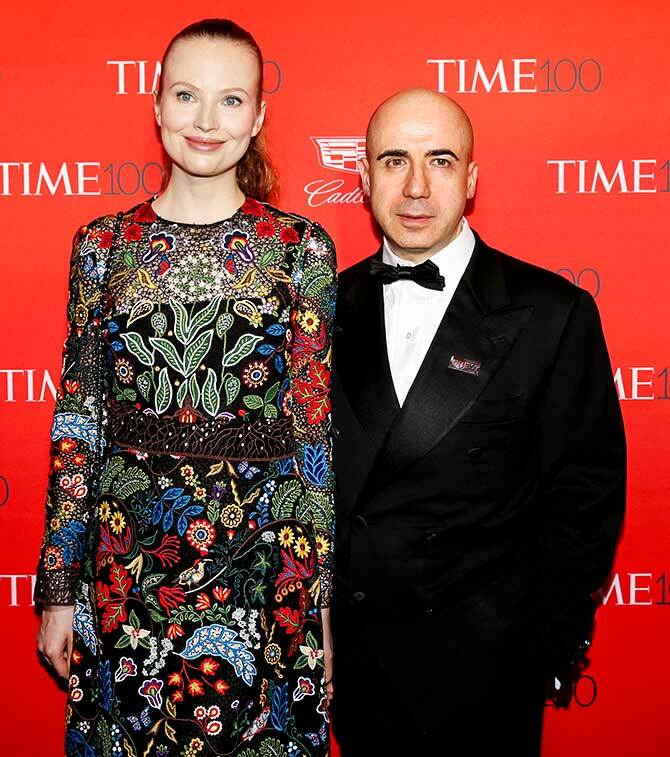 IMAGE: Yuri Milner, founder of DST Global, a private equity fund and one of Russia’s well-known oligarchs is looking at investing in India. Here Milner poses with an unidentified woman friend on the red carpet as they arrive for the TIME 100 Gala in Manhattan, New York, 2016. Photograph: Shannon Stapleton/Reuters. These include private equity funds run by Russia’s well-known oligarchs like Yuri Milner and Leonid Boguslavsky, oil and gas major Rosneft, heavy engineering giant Uralmash (which has announced a joint venture with SRB International to manufacture heavy equipment for the mining and steel industry), top bank Sberbank as well as Sistema JSFC (despite the telecom fiasco), which is straddling retailing, PE, and telecommunications. And for the first time, Russian defence companies have taken tentative steps by announcing a memorandum of understanding with the country’s top companies such as Larsen & Toubro, Reliance Infrastructure, and Bharat Forge. IMAGE: A bevy of Russian companies are now taking firmer steps to do business with India’s private sector companies after decades of working with only the government or State-owned behemoths. 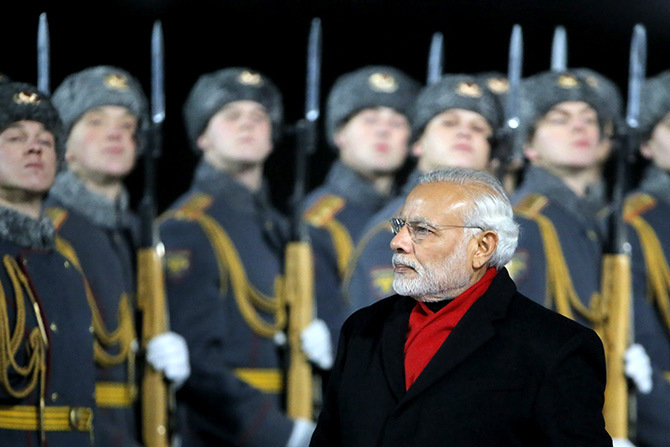 Visits like PM Narendra Modi's to Russia in 2015 have helped spark business interest. Modi is seen here at Moscow's Vnukovo Airport. Photograph: Maxim Shemetov/Reuters. Russia’s largest investment in the private sector has been through Rosneft, which, with their partners UCB and commodity trading giant Trafigura, bought Essar Oil at a staggering $13 billion. Those involved in the deal say that being a government-controlled company its decision to enter India was clearly “strategic” and the go-ahead has to come from the Kremlin. Analysts say that with the Russian government facing sanctions from the US and Europe after their invasion in Ukraine, there was a need to hedge their bets in oil. India provided the opportunity and Rosneft took only 49 per cent so that it was insulated against any sanctions in the future. It is estimated that Rosneft met 20 per cent of oil requirements of Europe in 2015. IMAGE: Leonid Boguslavsky, one of Russia's top VCs, is also interested in investing in India. Photograph: Courtesy, Leonid Boguslavsky/LinkedIn. Sberbank, the largest Russian bank, has been around for four years, but had not been making much headway, and had high non-performing assets. But last year it changed tack. Rather than providing loans to local companies, it decided to fund joint ventures with Russian and Indian companies. So now it is providing around $400 million for a project of Tata Power in eastern Europe. The Indian company has signed up with Siberian Coal Energy Co to mine coal and even set up a dedicated port in Russia. The bank is also offering to fund direct imports of gold as it sees large potential in the country. After all, Russia has some of the largest gold reserves in the world. It is the PE fund space that has attracted a lot of attention. Russian companies have fanned out across the globe and India has been a key target. Sistema, for instance, has decided to increase the size of its Asia Fund to $120 million from a mere $50 million. It is for the first time roping in Indian high net worth individuals to put in money in the fund. Rozanov says it will now go for bigger-ticket investments with shorter exits (three to four years, instead of seven years) and not put in money only in risky venture capital funding. Yuri Milner, who shot into the limelight by backing internet giants Facebook, Twitter, and Alibaba in their earlier stages, has spread his PE empire in India too. He made his first entry in 2014 with a bang when his company DST Global led a $250-million funding in Flipkart, followed in 2015 by Ola, in which it led a consortium that put in $315 million. Milner has also taken bets in other start-ups such as Practo, Craftsvilla, and Ratan Tata-backed home rental company NestAway Technologies. IMAGE: Russian president Vladimir Putin and Narendra Modi meet on the sidelines of the St Petersburg International Economic Forum in June 2017. Photograph: Sputnik/Alexei Druzhinin/Kremlin via Reuters. 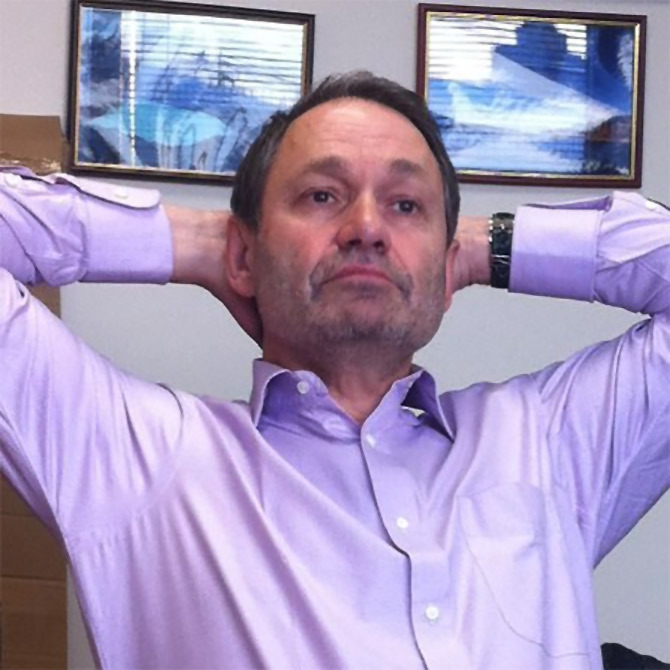 Keeping him company has been Boguslavsky, whose company Ru-Net has made a substantial bet in the country with investments in Snapdeal and FreeCharge, among others. With a net worth of $1.2 billion, Forbes says these two companies have been among his successful ventures. Yet there have also been some serious challenges to collaboration between private companies, especially in defence, an area in which India is being opened up to foreign direct investment. According to estimates, Russia, between 2012 and 2016, accounted for 68 per cent of India’s arms imports. Who's afraid of Rosneft India? Can India crack the Russian market?